Good morning, here is your Sunday Patriots news 01-20, & AFC East Notes. Politics and Sports: Most of us enjoy sports as an outlet free from the day-to-day politics that now permeate our lives. One of my other jobs is to write about military and politics. And it is frankly much less enjoyable than this one. And it is always an uncomfortable moment at least for some of us when the two worlds of sports and politics collide. Case in point, the Red Sox Alex Cora stating this week wavering on whether or not he’ll attend the ceremony at the White House to honor the Red Sox. Cora and the Sox are hardly the first in this. It has become a tradition for the standing President to host the winning team for a short visit for the purpose of honoring the champs. Now it has become a big story whoever wins a championship over who is NOT attending. Perhaps, because this country has become so partisan and intolerant of any views other than their own, it is time for the practice to end. When the President invites someone to the White House, it is supposed to be received as respect for the office and not necessarily the man that the invitee would attend. Sadly, we as a whole have forgotten that. Brady’s Accomplishments Get Pushed Aside Over the Cliff Talk: Trey Wingo on ESPN had a pretty interesting segment, that I caught on a replay, late on Sunday night after the Patriots win over the Chargers. But I bet if you watch many of those other national shows, you didn’t see that, right? Trade Foles? Folly: After the Eagles dramatic loss to the Saints last week when Nick Foles pass passed right thru Alshon Jeffrey’s hands for an interception to seal a win for New Orleans, we still see the “trade Nick Foles” talk. Foles led the Eagles to a Super Bowl win last season and got them on a hot streak down the stretch and nearly pulled off a monumental upset last week. Philly would be insane to trade him rather than Carson Wentz. But hey, trade him to New England. With that “cliff” right around the corner, I’d take that guy as my QB in a second. Julian Edelman had a huge game for the Patriots last week against the Chargers catching nine passes for 151 yards which comes as a surprise to no one who follows this team regularly. 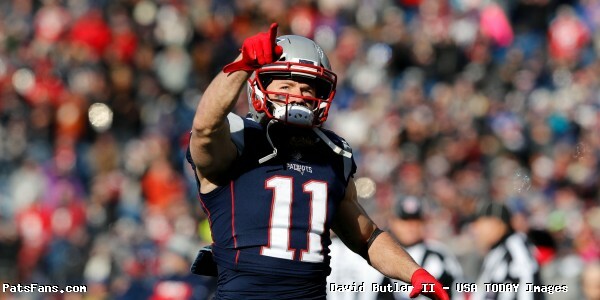 Edelman’s nine catches now rank him #2 all-time in the career playoff list behind only Jerry Rice. His 151-yard performance was the fifth in his career, the only two players with more 100-yard receiving games in the playoffs (Rice with 9 and Michael Irvin with 6) reside in Canton. Yet when people think of playoff superstars, does Edelman’s name ever come to mind? Perhaps it should start. His catch two years ago against the Falcons in the Super Bowl was the stuff of legend. His QB knows how valuable he is to this offense and on Monday Brady spoke about how Edelman (much like himself) had grown into a tremendous player. “You just remember when nobody thought about Julian as what he’s become, except Julian,” Brady said. If the Patriots are to win today and move on to Atlanta in the Super Bowl, they’ll no doubt need another big performance from Edelman. He currently ranks 7th all-time in playoff receiving yardage. With another 141 more, he’ll move all the way into 2nd place there, also behind Rice. Another two games could probably do the trick. It is amazing how underrated Edelman has been in his career. Still known only as a slot receiver, he’s been much, much more here in New England. He can play the “X”, the “Z” or the slot. He’s lined up in the backfield and runs the jet sweeps and returns kicks. He probably won’t sniff Canton, but perhaps when his playing career is over, he should be in the conversation. Not bad for an option QB, that had to go to Junior College and learn an entirely new position in the NFL. On his own network, one former player turned analyst gave the Chiefs every competitive advantage in the two teams’ matchups, (QB, RB, Pass Catchers, Defense, and Coaching). One said that he’d take any QB over Brady in the Divisional Round of the playoffs. Another had Brady 6th among trusted QBs in the playoffs. The ESPN “Power Poll” gives New England the least chance of winning the SB with a 15 percent chance of winning it all. And there were plenty of writers who gladly jumped on the “Patriots dynasty is dead” storyline only to see the Pats put a curb-stomping on the Chargers the likes of which we haven’t seen since “A Bronx Tale” bar scene. Flashback to Week 6, NE gave up a 97-yard KO return, a 67-yard TD pass, a 75-yard TD pass, and Brady fumbled at the New England 29 to set up the Chiefs on a short field. Hardly perfect, but yet the Patriots won. Make no mistake, they have to play an excellent game tonight, but perfect? No. The Chiefs are latest, team du jour who everyone is rallying around as the next great team, and the one they want/hope will dethrone the Patriots. One Patriots’ key to winning this game is to remain balanced on offense and having the running game be effective. Their still a passing team first, however, an effective running game keeps the defenses honest and slows down the pass rushers, allowing Brady to throw from a clean pocket. The Patriots have been running a lot of “21 Personnel” (2 RB, 1 TE, 2WR) packages down the stretch. And it has been a big reason why the offense has been so effective. They can mix and match different combinations with the backs and it gives options to Brady on how he wants to attack the defense, given how they match up defensively. During the Week 6 matchup, the Patriots shredded KC’s defense when running the “21” package. They had a 65 percent success rate while running out of it with an average of 5.1 yards per rushing attempt. And an even better success rate of passing out of it, with an 80 percent success rate where Brady averaged 15.4 yards per attempt while passing out of the “21” package. 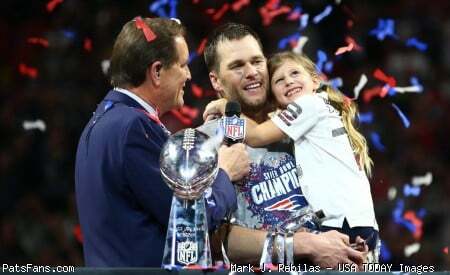 This entry was posted in 2018 Patriots playoffs, NFL Commentary, NFL News, Patriots Commentary, Patriots News, Patriots Rumors and tagged "the Patriots dynasty is dead", Bill Belichick, James White, Julian Edelman, Kansas City Chiefs, New England Patriots, NFL, NFL news, Patriots embrace underdog role, Rex Burkhead, Rob Gronkowski, Sony Michel, Tom Brady on January 20, 2019 by Steve Balestrieri.